Audience members scope Keith Rowe’s guitar. 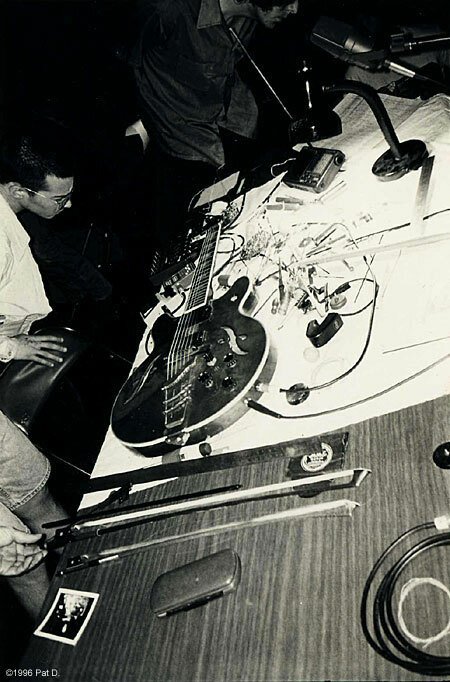 Photo by Pat D.
AMM is a British free improvisation group that has been operating since 1965, when they pretty much single-handedly invented the genre. From the very beginning, they attempted to make music that was not influenced by anything that came before–a complete and radical break with the past–and their first record, AMMusic from 1966, proves it. Imagine my surprise when I heard they were scheduled to play two nights at The Ivar Theatre in Los Angeles. Although I didn’t attend the first night, two separate little birds told me it was one thick, elementary school stage curtain of sound with occasional moments of transcendence and boredom. You are currently browsing the archives for the AMM category.